Patients often complain about a lack of Wi-Fi and the blandness of hospital food, but one big complaint healthcare providers should put above the rest is patient gowns. When patients have negative attitudes toward gowns, they may be uncooperative in wearing this garment, which may affect medical treatment. In addition, the wrong patient gown can result in a feeling of indignity and physical harm to the patient. Although the design of having a patient gown open in the back is meant for accessibility for medical professionals, patient comfort is often lacking because they feel too exposed. This feeling may also be a result of an improperly fitting gown. Gowns are also frequently too loose for patients, and they may need to hold up this excess fabric when moving around the hospital or other healthcare settings, becoming more self-conscious about the gown and its appearance. 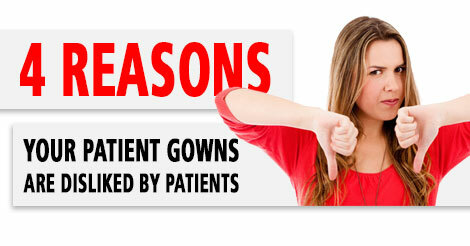 In a recent study published in the International Journal of Nursing Sciences on patient attitudes regarding gowns, almost 58 percent of patients observed refused to wear patient gowns. Of these patients who were unwilling to put on gowns, nearly 44 percent said wearing them made them psychologically uncomfortable. The feeling of exposure is likely a factor in their attitudes. Related to poor fit, patients may complain that the length of the patient gown is shorter than they would prefer. With the length of gowns being too short, they tend to feel as if they are lacking in modesty. As patients need more coverage to feel more comfortable, gowns that are a generous length and have a round neck as opposed to a more open scoop neck are a good solution to enhance patient dignity. A major complaint about patient gowns is their inability to wick away moisture from perspiration or other sources of fluid, according to clinical resource experts. Not only can these gowns interfere with the regulation of body temperature, the excess moisture can exacerbate skin damage during patient repositioning. Ensuring gowns are constructed with breathable fabric is crucial to both patient health and comfort. In the International Journal of Nursing Sciences published study, more than 1 in 4 patients attributed their negative attitude toward their gowns to the clothing's comfort level since many of the gowns in the study were made of a non-absorbent fabric. As hospitals choose gowns that are designed for durability, these garment items are typically made of materials that patients complain are rough and stiff. This is another reason why patients would likely prefer a brushed 100% synthetic gown that is more comfortable and that will withstand numerous washes. Addressing these complaints about patient gowns should be a priority for health care providers to boost overall patient health and safety. For more information on an improved, more comfortable gown, visit MIP Inc's SOLUS™ Patient Gown product page, or read the SOLUS™ white paper.